It's been a while since I've posted a soup recipe - but don't think we haven't been enjoying warm, comforting meals. I have a lot of soup recipes lined up to share with you. They are all winners, trust me. 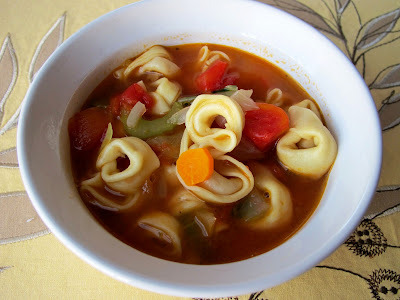 This recipe for Tomato Tortellini Soup caught my eye as I was searching for meals that included bok choy. Y'all, the organic farm that we have our CSA box through must be lovers of bok choy. We seriously get it every.single.week. I kid you not. I made a tofu stir-fry a couple weeks ago that used up some bok choy, but I wanted to branch out from stir-fries. Bok choy is so much more than that! The original recipe called for sun-dried tomatoes. Well, being the frugal person that I am, I just used canned, diced tomatoes. It was perfect. That's the great thing about cooking in your own kitchen - you can swap out ingredients to your liking (or what you have on-hand!). Heat oil in a large Dutch oven over medium-high heat. Add onion, carrot, celery, and garlic; sauté 5 minutes. Add broth and next 5 ingredients (through bay leaf); bring to a boil. Reduce heat; simmer 2 minutes. Add pasta and bok choy; simmer 7 minutes or until pasta is done. Discard bay leaf. Yum! Tortellini is my favorite pasta, and I LOVE soup, so this recipe is a win-win for me:-).Thanks for sharing your talents! I love tortellini too! I like your change of switching out the sundried tomatoes for the canned diced -sometimes I think sundried owerwhelm. I find many of the recipes in Cooking Light winners! I'm on a soup kick too -can't wait to see more of yours! Love this recipe. I've not ever made a tortellini soup. I love tortellini!! And I love the idea of this pasta in a soup, I've never tried it and I think I'm going to have to. My mom makes a soup just like this, and tops it with a little pesto! It's so good! Hey Courtney! Just wanted to let you know that you won the giveaway for the Follis handbag over at my blog! You can email me your shipping address at askblondeambition@gmail.com anytime!